This time the Opposition has urged the Sports minister Justin Tkatchenko to debate intellectually on issues of national interests without making personal attacks. Its leader Don Pomb Polye said Tkatchenko’s remark, asking him to buy hearing and listening devices, was below his belt. Mr Polye has described this statement as ‘personal vendetta and that it does not reflect someone of his (Tkatchenko’s) caliber. “All I am asking for from the learned minister is, when he is going to replace the scaffold at the Sir John Guise stadium with a concrete structure? “The tax payers deserve to know the truth as to what happened to the millions of kina with inflated cost variations because our people were imposed upon via taxes to cover the cost of the stadium,” said a well-versed Mr Polye. He still maintained that Tkatchenko’s comment in the media as evasive to avoid answering the questions on why the stadium is incomplete. He said the minister took an undertaking that he would get it replaced when the Pacific Games was over. “Leaders, including myself, are the servant of our people and that we are answerable to them as far as their welfare is concerned,” he said. 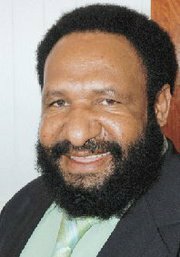 Polye said he was only concerned on behalf of the people as the Opposition Leader but also as a tax payer. “There has been a trend in which the cost of city projects have been inflated and awarded to companies which are owned by members of Parliament and cabinet ministers and I hope the controversial Taurama road project’s K138 million is not an inflated cost,” said Mr Polye.